This book is fascinating. You must have had a long period of time each day practicing your rhyming. The rhymes and pictures are amusing. I bet everybody in the world must love the story. You are lucky that you got Tony Ross [one of my favourite artists] to paint the stunning pictures. It is about a hippo that has a spot on its bottom. He asks all of his jungle friends to try to heal it because he doesn’t like it because he finds it really itchy. I would recommend it for 5-year-olds because they would like it. I have spent the past term with a very intelligent, imaginative, creative bunch of 9-year-olds. Their challenge this week has been to form opinions about texts and justify their opinions. Over the next few days I look forward to sharing their picture book reviews with you. I am very thankful that you wrote this book, this is really a good book. When I’m reading this book, you show how funny Pig the Pug is, and he is so cute. This book is my favourite book, I’ve got one at home, but of course there is one in our school library. After I read your book, I changed my mind and I want to have a dog. I hope you have different kinds of Pig the Pug books coming up. The Pig the pug books are a hilarious set of books fit for any age from junior to senior. Kids and parents will be giggling from start to finish as greedy old pig makes all sorts of mischief and learns the right thing to do. Pig the Pug is a funny book. It’s about two dogs and one of the dogs would not share. It has a lot of rhymes, I recommend you read it to 7-year-olds or younger but I bet people older than 7 would still enjoy it as much a 7-year-old would enjoy it. Check out Pig the Pug at Auckland Libraries. As you may have noticed, things have been a little on the quiet side here on myfriendlucy. As a teacher I think I became the number one fan of my own blog, I always had a stash of the best picture books in my classroom. All sorts of great plans for blog posts on how to use various picture books with kids have been percolating over the past couple of years, but sadly they will never come to fruition because instead… I’m sailing off into the deep blue yonder. My husband and I have both quit our jobs and we are sailing over to Tonga in May. It’s about as far from picture books as it is possible to get (although I plan on having a stash on board, and a few puppets for entertaining small people we meet along the way). I have started a new blog where you are more than welcome to join me for some very different adventures. Hello again world. I know I know, it’s been far too long. All my promises of continuing to blog after my year was up fell apart slightly. However, in good news, I have now completed my Grad Dip in Teaching, have a job lined up for next year (teaching new entrants!) and am officially on holiday. I won’t do anything rash and make any blog-frequency promises, we’ll just see how it goes. Okay with you? There will probably be more “teacher stuff,” but I can promise there will always be picture books. Pete the Cat is such a stunner and today’s Pete book is full of maths. Hooray, love maths! Pete begins his day with four buttons. After several popping incidents, he ends up entirely button less, well apart from one special body button that is. With a super groovy song, a nice message and numbers galore, this is picture book party central. There are heaps of great ideas for using this book in the primary school classroom, with a particularly fantastic selection on this blog. It’s nice to be back, if I’ve missed any picture book gems in the last few months, feel free to let me know. Check out Pete the Cat and his four groovy buttons at Auckland Libraries. One year, 365 picture books… success! This is what 365 picture books look like. Woohoo! I have made it to the end of my 365 days of picture book reviews. To celebrate I’m not going to review a picture book today. I tricked you all! Instead, I am going all Oscars on it, excuse me while I try not to stumble up the stairs to the microphone. Firstly I would like to thank my lovely husband John who has put up with mounds of picture books in our lounge for the past year, random requests for his opinion on particular titles, and me saying “Just give me five minutes, I haven’t posted my review yet for today.” You are a good man John. Next up, mum and my mother-in-law, Marilyn. Combined, their powers of proof reading have (hopefully) made my blog error free. It did lead to some slightly cryptic text messages including the following from my mother, “Does a light bulb go off or on?” which turned out to be an editing suggestion for this post. Thanks mums, you are officially my number one fans. 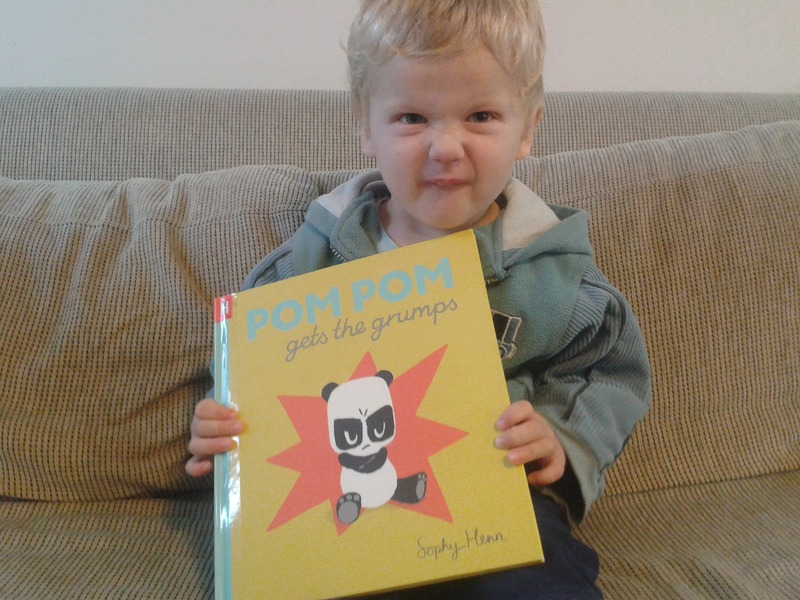 Sammy harrumphing, like Pom Pom the grumpy panda. My sister and her three awesome children, have been a willing and enthusiastic audience for many of the books I have reviewed. Two hours babysitting Sammy (aged 2) was filled entirely by me reading books to him (okay so we did have a short break to dance like Gerald). Your kids are great Emily, and so are you! Thanks also to the lovely staff at Panmure Library for processing my hundreds of book requests and for occasionally letting me blow my 35 book-borrowing limit. And a big shout out to Auckland Libraries’ Collections team who unquestioningly bought all of my new picture book suggestions, I love you guys! Geez this is starting to become a little epic so I’ll wind things up. Congratulations to all the amazing picture book authors, illustrators, designers and publishers who work so hard. My mind on many occasions over the past year has been blown by the creativity, humour and beauty present in the pages of picture books. Keep up the good work, you are making the world a better place. And finally thank you to everyone who has popped on by, commented, suggested titles, offered advice, contributed reviews and been generally enthusiastic about myfriendlucy. I have had an amazing year, and look forward to continuing to review in the future, albeit on a far less frequent basis. The out-loud-reading-speed-test is a wee invention of mine, that gives a fairly accurate indication of how fun a picture book is to read aloud. It’s pretty scientific/mathematical, so I won’t bore you with all the formulae, but, in simple terms, if I find myself reading a book really fast by the end, it means it’s a winner. As I trial-read Whoops! to my husband while he cooked dinner, I accelerated to such speeds, he nearly lost his eyebrows. A definite A+ on that test paper. It’s not just the cat with vocalisation issues, her friends dog and mouse are also decidedly voiceless. The owl recommends a visit to the old lady at the tumbledown house who will have just the spell for the silent trio. “She went to look at her big spell book. She cast a spell but the whole house shook. Then the wind blew in. Her first attempts at spell casting are not hugely successful, so the whole process is repeated… several times. Finally everything is right with the world again, the cat miaows, the dog barks and the mouse squeaks. And the little old lady? Well, you’ll just have to read the book to find out what happens to her! A whole bunch of fun in a very stylish package. Check out Whoops! at Auckland Libraries. Or buy Whoops! from Fishpond. I am no child psychologist, but I can tell from the cover alone that Zippo is going to be a hit with the young ‘uns. “How Lucy? How do you know this?” Well team, I can guarantee that any book with the phrase “Bottom Power” on the cover, which features a large hippo in underpants will be instant “read it again” material. 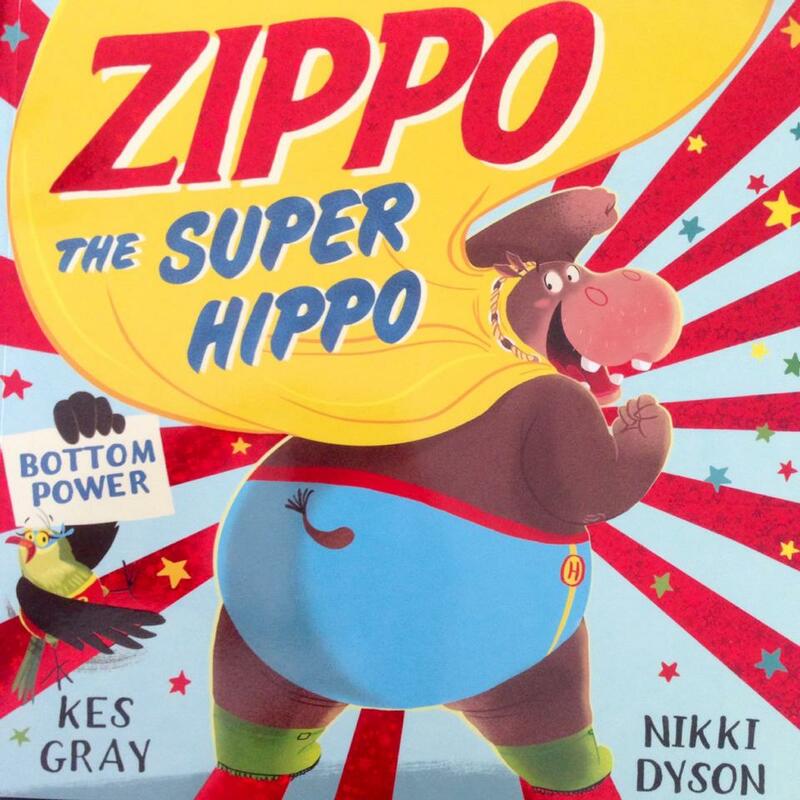 Zippo the hippo has a hankering for being super, for having a super power to be more precise. By process of elimination, he and his friend Roxi hit upon flying as the perfect power for him. “You’re right!” said Zippo. 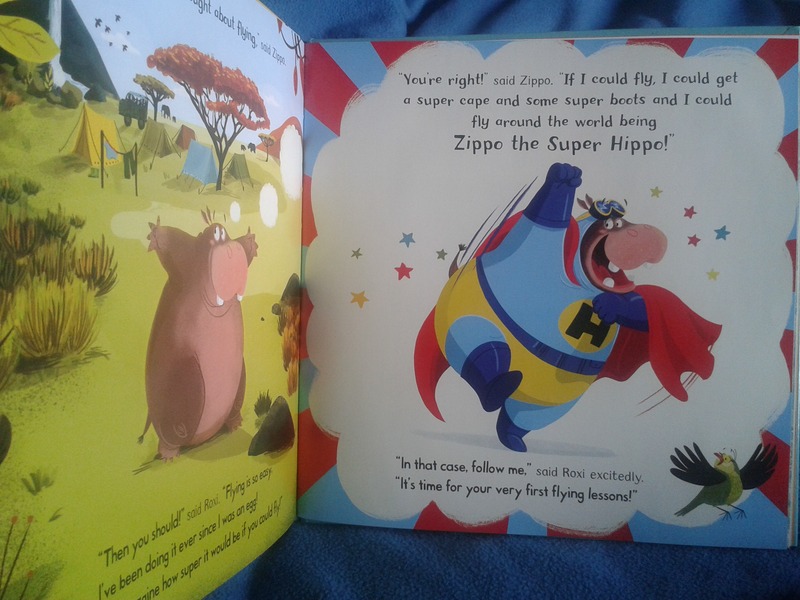 “If I could fly, I could get a super cape and some super boots and I could fly around the world being Zippo the Super Hippo!” Zippo’s attempts at launching himself elegantly in the air fail miserably, ending each time with a giant splat, and an animal squashed beneath his admirable bottom. In good news, it turns out that super bottoms can be quite a weapon against misbehaving animals. And so, Zippo the Super Hippo is born. There are all sorts of goodies hidden in the pages of this beautifully illustrated, hilariously told story. Come on down Zippo, we’ve saved you a place in the inner circle of friends here at myfriendlucy! Check out Zippo the Super Hippo at Auckland Libraries. Or buy Zippo the Super Hippo from Fishpond.